Anyone Want to See an Incredibly Sassy Twitter Fight Between Two New York Political Officials? It all started when Bill de Blasio announced on the radio this morning that if he becomes mayor he plans on replacing Bloomberg appointee David Yassky as taxi commissioner. 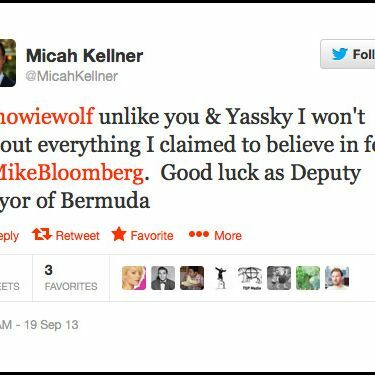 Nothing out of the ordinary there, but the comment ended up sparking a brief but incredibly nasty Twitter beef between Bloomberg adviser Howard Wolfson and Upper East Side state assemblyman Micah Kellner, one that seemed to feed on a deep, ancient, mutual hatred. Here is that Twitter fight, somewhat annotated. Wolfson didn’t take kindly to that.
.@howiewolf no I think you are confused- its you who is out of work at the end of the year. And Amen to that! @MicahKellner among the differences btwn you and Yassky is that he passed the vet for commissioner. You wouldn't. And that’s it. Fun stuff.